SiriToggles Cydia Tweak Can Launch Apps, Perform System Operations And More! Siri for iPhone 4S brings a lot to the device, but doesn’t actually let you launch any apps, control brightness, volume or unlock your device. Wouldn’t it be nice if you could just ask Siri to reduce the brightness of your iDevice, or asked it to launch a third party app like Angry Birds. With the jailbreak out for iPhone 4S, new tweaks for Siri are already out and about. Recently, we also told you about a hands free tweak that can be used to launch Siri without even touching your iPhone. Here’s another Cydia tweak, that will make launching apps and controlling system settings via Siri very much a reality. 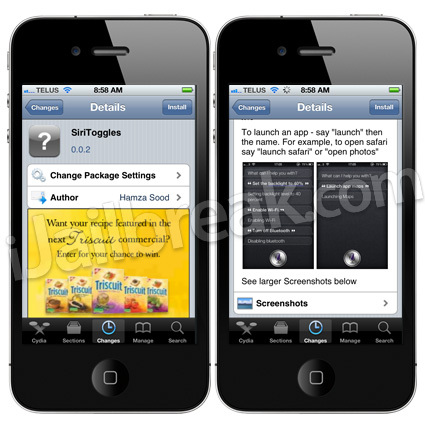 SiriToggles is a new tweak available for the jailbroken iPhone 4S and older devices that are running Siri. You can basically use this tweak to launch any app on your device, including jailbroken and third-party apps. That’s not it! You can also use this tweak to reboot your device, respring, control brightness, volume and other system settings like toggle on/off Wi-Fi, 3G, Airplane mode etc. To toggle on/off a setting, say ‘Enable/Disable’ or ‘Turn On/Off’ followed by the system setting like Wi-Fi, Bluetooth, Data, 3G and Airplane Mode. To check battery level, say ‘How much Battery do I have left’ or ‘what is my battery percentage’ or something conversational that you can think of. To change brightness, say ‘set/change backlight/brightness to %’. To launch an app, just use ‘launch’ or ‘open’ followed by the name of the app. Pretty awesome isn’t it? Another good thing about this Cydia tweak is the fact that it is being distributed for free in the BigBoss repo. You can also try this along with Hands-Free control tweak and spice things up a notch. Try this tweak now and let us know what you think of it! We highly recommend you to try it out, especially if you own an iPhone 4S. Do this also work on iPhone 4 with spire and german language?